There are no views quite as spectacular as those in New Zealand. This ride will take you to the most scenic landscapes in New Zealand. You will encounter the majesty of New Zealand, riding alongside flowing rivers with towering mountains as your backdrop. Mackenzie country offers some of the most serene countryside in the world. Your ride will take you through famous vineyards rural farmland and emerald green valleys. New Zealand's trails will take you far from any big town. You will experience the ultimate cycling holiday off the beaten track. We will collect you from the centre of Christchurch this morning and drive south to Geraldine. From here, you will cycle quiet sealed roads through picturesque countryside, before stopping for lunch in Fairlie. After lunch we will drive to Lake Tekapo Village. Its picturesque lake is the first of the storage lakes which feed the hydro schemes in the basin and down the Waitaki Valley. Here you take your first ride from the alternate start on the Alps to Ocean Cycle Trail, on the quiet roads that follow the turquoise blue waters of the canal system. You will finish the ride in Tepako and have the option to visit the local hot pools to ease any first day muscle aches. After breakfast this morning we drive to our next cycling point on the Alps to Ocean Cycle Trail. 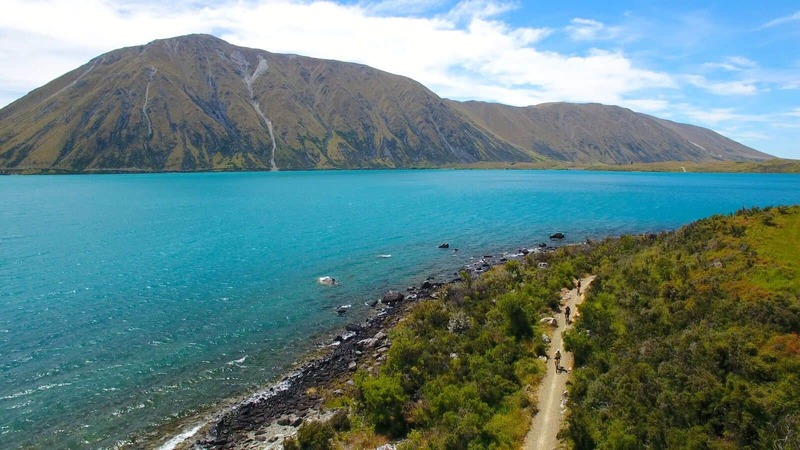 From here, you will enjoy flat easy riding past salmon farms to the edge of Lake Pukaki, joining the lakeside cycle trail and with spectacular mountain vistas. Mt Cook beckons in the distance and so we load up and drive to The Hermitage where you have the option to enjoy a visit to the Sir Edmund Hillary Alpine Centre or the Aoraki/Mount Cook National Park visitor centre. Stunning views of the 26 km long Tasman Glacier and Mt Cook are our reward for a short walk, before we drive back to Lake Pukaki for a final ride on the trail across the extensive tussock-lands of Pukaki flats to Twizel, where we stay tonight. This morning you will cycle past Lakes Ruataniwha and Ohau, mostly on cycle trails, to Lake Ohau Lodge for lunch. After refuelling, if you would like a challenge you can continue on the trail, which starts its steady climb up to the Tambrae Saddle. At 900m this is the highpoint of the whole Alps to Ocean Cycle Trail and your efforts are rewarded with stunning views across the Mackenzie Basin. If you want a more relaxing afternoon there is the option to jump on a transfer and enjoy a final, mostly downhill and flat ride on the trail into Omarama, our stop for the night. Omarama is called “Place of Light” in Maori for its extraordinarily pure and clear sky. You will set off this morning, following the trail to Sailors Cutting, along the shores of Lake Benmore. From here there is the option to climb to the Otematata saddle or to take the support van to the top and enjoy a fabulous downhill cycle towards Aviemore Dam, where you will enjoy a lakeside picnic. We finish today in Kurow. Once you’ve arrived, we recommend exploring the town by bike. Take a ride from the bridge over the Waitaki River to the beautifully restored St. Albans Church, then to the local Pasquale vineyards to taste award winning wines. Tonights accommodation is at the Waitaki Braids Lodge where elegant ensuite rooms, open onto their own small conservatory and local art adorn the walls. Dinner is served in the comfortable onsite restaurant by an award winning chef serving local produce and wines. This is the perfect place to relax whilst recovering from a days biking. This morning the cycle trail takes us along the banks of the Waitaki River and through Kurow vineyards. We pass by a Maori rock art site before reaching Duntroon where we turn inland to cycle on a mixture of trail and quiet rural roads. A walk amongst the unusual rock formations known locally as Elephant Rocks is a must on the way past. Following a short section of an old branch railway line we cycle through Raki’s tunnel before a downhill ride into the settlement of Windsor. We spend our last evening together at the historic Victorian Burnside Homestead and have a delicious dinner to celebrate. Today we are bound for Christchurch but not before we finish our Alps to Ocean journey with a final ride. Cycling from our accommodation we ride through picturesque rolling rural countryside and pass the Oamaru Stone quarry. Oamaru Stone has been extracted from the district since the 19th Century and its influence on local architecture is clearly seen as we ride our final section into the harbourside town of Oamaru. Here there is time to explore the old Victorian Precinct with its many galleries, shops and cafes. There may also be time for an optional visit to the fascinating Steampunk Museum (own expense). After a late lunch we will travel back to Christchurch, passing through some of the rich agricultural regions of the Canterbury Plains. The tour ends today so you can either make your own arrangements this evening or we can help you. If you’re looking for bucket list rides, epic scenery and the world’s playground, then you’ve found it in New Zealand. The country is littered with old railways converted into cycle trails taking you into the heart of the country. Crystal clear lakes reflect the towering snow capped mountains, suspension bridges snake their way through golden forests and on either side of the island, you can ride along the shore of New Zealand’s crisp blue waters. The holiday is guided by knowledgeable and friendly guides. Your ride will be followed by a support van equipped with plenty of refreshments as well as a comprehensive first-aid kit. Alternatively, if you would like to do this tour privately, this can be arranged, just ask our cycling experts. The bike you will hire will give you a comfortable ride as you cruise through New Zealand it is equipped with water bottle holders and an area to keep a small day bag. We can upgrade you to a mountain bike or electric bike too if you prefer. If you would like to bring your own bike instead, please let our cycling experience team know.